I recently wrote about the Cos method. While rereading the various papers on Heston semi-analytical pricing, especially the nice summary by Schmelzle, it struck me how close were the Attari/Bates methods and the Cos method derivations. I then started wondering if Attari was really much worse than the Cos method or not. I noticed that Attari method accuracy is directly linked to the underlying Gaussian quadrature method accuracy. I found that the doubly adaptive Newton-Cotes quadrature by Espelid (coteda) was the most accurate/fastest on this problem (compared to Gauss-Laguerre/Legendre/Extrapolated Simpson/Lobatto). If the accuracy of the integration is 1e-6, Attari maximum accuracy will also be 1E-6, this means that very out of the money options will be completely mispriced (might even be negative). In a sense it is similar to what I observed on the Cos method. "Lord-Kahl" uses 1e-4 integration accuracy, "Attari" uses 1E-6, and "Cos" uses 128 points. The reference is computed using Lord-Kahl with Newton-Cotes & 1E-10 integration accuracy. 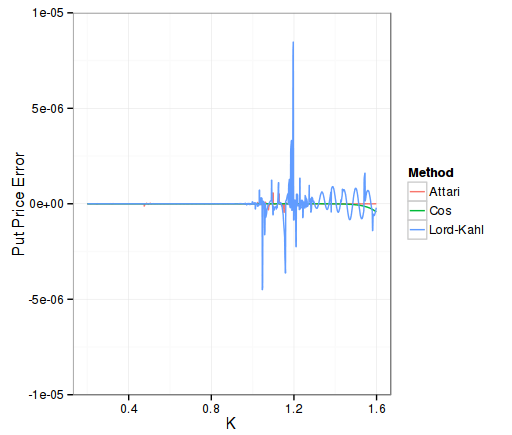 As expected, Lord-Kahl absolute accuracy is only 1E-5 (a bit better than 1E-4 integration accuracy), while Attari is a bit better than 1E-6, and Cos is nearly 1E-7 (higher inaccuracy in the high strikes, probably because of the truncation inherent in the Cos method). The relative error tells a different story, Lord-Kahl is 1E-4 accurate here, over the full range of strikes. It is the only method to be accurate for very out of the money options: the optimal alpha allows to go beyond machine epsilon without problems. The Cos method can only go to absolute accuracy of around 5E-10 and will oscillate around, while the reference prices can be as low as 1E-25. Similarly Attari method will oscillate around 5E-8. What's interesting is how much time it takes to price 1000 options of various strikes and same maturity. In Attari, the charateristic function is cached. The Cos method is around 7x faster than Attari, for a higher accuracy. Lord-Kahl is almost 8x slower than Cos, which is still quite impressive given that here, the characteristic function is not cached, plus it can price very OTM options while following a more useful relative accuracy measure. When pricing 10 options only, Lord-Kahl becomes faster than Attari, but Cos is still faster by a factor of 3 to 5. It's also quite impressive that on my small laptop I can price nearly 100K options per second with Heston. I am still amazed at the difference. 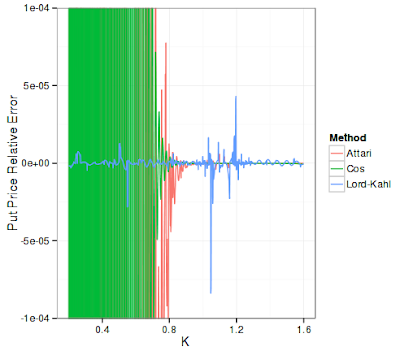 The graphs very nicely show an adaptive integration behavior: the accuracy graph for Lord-Kahl has spikes when the adaptive error criteria is just reached and waves when the real error is much lower (i.e. like a non adaptive algo).